The carolers of 16th century England knew how important Christmas pudding was during the holiday season (figgy pudding was one variation). Most cherished in England, this pudding still remains the traditional end to the Christmas feast in many households today. However, Christmas pudding has changed quite a bit from its initial incarnation and has origins that might surprise you. Christmas pudding today is composed of many different “types of dried fruits, among them raisins, figs, prunes and glacé fruits, as well as citrus zest and nuts. Eggs, breadcrumbs and suet (beef or mutton fat from around the kidney) helps hold the mixture of fruits and nuts together. It is then pressed into a bowl, covered with parchment, and steamed in a pot on the stove for hours and hours until cooked.” Usually, the pudding is made well in advance of the holiday meal. Traditionally it is made on the Sunday before Advent, but is sometimes prepared up to a year in advance. It is then wrapped in a cloth and hung in a dry place to await its debut. 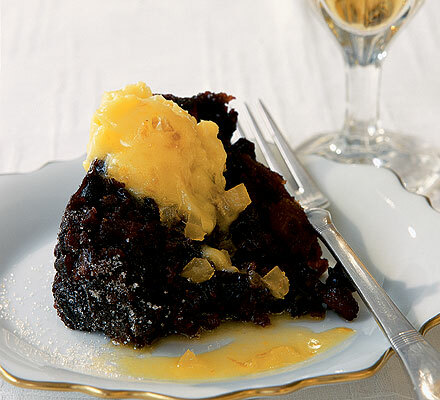 The many fruits included in the pudding make it reminiscent of ancient Roman and Egyptian fruitcakes, another popular holiday dessert related to the Christmas pudding. Egyptians put their versions in the tombs of the dead, but the Romans were the ones who made the cakes popular. Click here to read more about these ancient fruitcakes, courtesy of How Stuff Works. Often the Christmas pudding is doused in brandy and lit on fire when presented at the end of the feast. This harkens back to the practices of the ancient Celtic Druids who lit great bonfires at the winter solstice meant to give power to the dying sun and to hold back the approaching dark. Frumenty, another forerunner, was a porridge involving cracked wheat, currants and almonds, which eventually turned into plum pudding when more dried fruits, eggs and breadcrumbs were added. Mince pies with dried fruit, also a precursor to the Christmas pudding, were made to preserve meat through the winter. There are many traditions and even superstitions involved with the Christmas pudding. It must be made with 13 ingredients to represent Jesus and each of his 12 disciples. The pudding should be made on “Stir Up Sunday,” which is the Sunday before Advent. Every member of the family must stir the pudding in an east-west (clockwise) motion at least once using a wooden spoon. This honors the wise men who came on the night of Christ’s birth. The cook should always make a wish while stirring the batter. While Christmas pudding is still made the traditional way in most households, it is possible with our modern technology to take a short-cut using the microwave and jump straight to the indulging. Whether you stick to the time-honored and time-consuming recipe or you opt for the shortest route to your pudding, make this historic dish a part of your festivities this year. Below you’ll find a fantastic recipe for Classic Christmas Pudding or scroll down to view a video recipe of a microwavable version. Holding the butter in its wrapper, grate a quarter of it into the bowl, then stir everything together. Repeat until all the butter is grated, then stir for 3-4 minutes – the mixture is ready when it subsides slightly after each stir. Ask the family to stir too, and get everyone to make a wish. Now stand each bowl on a large sheet of foil and bring the edges up over the top, then put another sheet of foil over the top and bring it down underneath to make a double package (this makes the puddings watertight). Tie with more string, and make a handle for easy lifting in and out of the pan. Watch the video to see how to tie up a pudding correctly. Classic Christmas Pudding by Microwave! Erdos, J. (2011, December 15). Christmas Pudding: What Is It, Anyway? Retrieved December 11, 2014. Broomfield, A. (2007). Food and cooking in Victorian England: A history. Westport, Conn.: Praeger. Thring, O. (2010, December 21). Consider Christmas Pudding. Retrieved December 11, 2014. This entry was posted in Blog, Bon Appetit Wednesday, Culinary, Culture and tagged ancient pudding, ancient recipes, AntiquityNOW, Bon Appetit Wednesday, Christmas pudding, figgy pudding, fruitcake. Bookmark the permalink.